FREE, max 2 tickets per person. Audience members must be aged 18 or over. Terms & conditions apply. Booking fees are waived for this event. Jazz and TV history will be made when the iconic 1960’s BBC show Jazz 625 returns for one night only on BBC Four – broadcasting live from Cheltenham during the Jazz Festival! The show will feature a house band – led by pianist Robert Mitchell – with special guests including Gregory Porter, Joshua Redman, Jean Toussaint, Shirley Tetteh and Jacqui Dankworth. There’s also an exclusive recorded performance from Rolling Stones drummer Charlie Watts, showing off his jazz-chops in a quartet with saxophonist Scott Hamilton and a new interview with Dame Cleo Laine reflecting on her performance on a classic edition of Jazz 625. Jazz 625 broadcast on BBC 2 from 1964 to 1966 and featured classic performances from the likes of Duke Ellington, Thelonious Monk, Dizzy Gillespie, Ronnie Scott and Dave Brubeck. This one-night revival will feature selections from the archive and live music from the house band, with guests, paying tribute to those who performed in the original series. In tribute to the original series, the programme will be broadcast in black and white – the first live black and white BBC TV show since 1974! A display celebrating Jazz 625 will also be running at Parabola Arts Centre Friday to Sunday during the Cheltenham Jazz Festival. 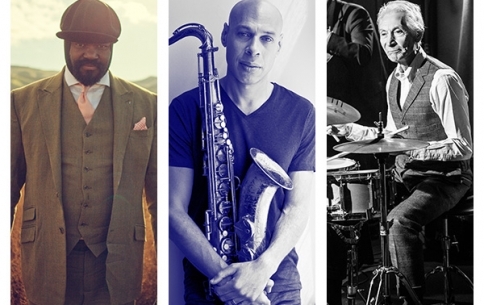 If you’re not lucky enough to get tickets for this event you can catch the Jazz 625 live broadcast on BBC Four at 9pm on Friday 3 May. A number of accessible spaces are available for wheelchair users. To secure your ticket, please call our Box Office on 01242 850270. To ensure that the event is full we need to oversell for this event. Requesting tickets and receiving an order confirmation email from Cheltenham Festivals does not guarantee you admission to this event. You will only be issued with a ticket for the event on the day of the event by bringing the order confirmation email and relevant ID (see terms and conditions below) with you to the Cheltenham Jazz Festival Box Office between 11am – 7pm on Friday 3 May. This is a BBC event and as such Cheltenham Festivals must adhere to BBC Fairness guidelines which sets out that everyone must be given an equal opportunity to claim tickets on a first come first served basis. Cheltenham Festivals Patrons, Champions, Partners and Members will therefore not receive priority booking for this event. This event will be filmed. By requesting tickets you accept that you will be happy to be filmed at this event. Release forms will need to be completed to gain admission to the event. You must bring approved photo ID (drivers licence, passport, Biometric Residents permit, Citizen card, Validate UK ID card, HM Forces ID card, HMRC Access All Supervisor card, Police warrant card, Photographic travel card (eg. Freedom Pass) to prove this when collecting your tickets on the day of the event between 11am – 7pm from the Festival Village Box Office in Montpellier Gardens.